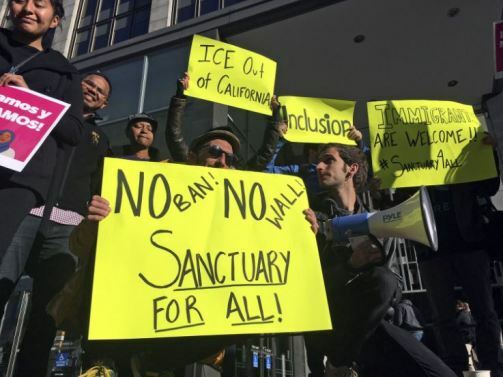 SACRAMENTO, Calif. (CN) – A federal judge on Thursday ordered the nation’s top immigration official to answer questions under oath in a contentious U.S. Department of Justice lawsuit against California’s sanctuary laws. The state will have four hours each to interview Homan and Todd Hoffman, a U.S. Customs and Border Protection official, by April 13 in Washington. Newman said the questioning must be limited to specific instances of irreparable injury outlined in Homan and Hoffman’s declarations and also ordered the officials to bring evidence to back up their claims. California Attorney General Xavier Becerra called the ruling a victory for the state. “We believe the rule of law is on our side. Our public safety laws work in concert, not conflict, with the federal government,” Becerra said in a statement. In a joint brief filed Monday, the state called Homan’s declaration the “crux” of the feds’ case. The lawsuit was filed March 6 in Sacramento by U.S. Attorney General Jeff Sessions. He introduced the lawsuit and simultaneously bashed California’s immigration policies in a speech before dozens of the state’s top law enforcement officials. The Trump administration wants U.S. District Judge John Mendez to freeze three of the state’s sanctuary laws while the matter plays out in federal court. Gov. Jerry Brown signed the three challenged statutes in June and October last year. Among other things, they limit state and local law enforcement cooperation with ICE agents, bar private employers from voluntarily sharing information with ICE and allow the state to inspect immigration jails. California asked for a full day with Homan and Hoffman, citing the length of their declarations. The state’s lawyers questioned ICE’s credibility, noting recent claims by a former ICE spokesman who resigned after a large-scale immigration sweep in California. “I quit because I didn’t want to perpetuate misleading facts,” said former ICE employee James Schwab. The Justice Department called the interview requests a stall tactic, arguing that all of the information needed to respond to the motion for preliminary injunction was included in the immigration officials’ declarations. California has also asked for the case to be transferred from Sacramento to San Francisco, where most of its 28 pending lawsuits against the Trump administration have been filed. Sessions has opposed the transfer, which is still pending. Some experts predict the case will be an extended legal battle that could last beyond Trump’s first term and will likely settled by the Supreme Court. “Whenever you get a federalism case of this kind, and you get some resolution on it, it almost inevitably has implications for other federalism cases in other areas,” said Jon Dinan, a Wake Forest University professor who specializes in federalism.